No Difference Between “Krishna” and Krishna? “There is no division between the name and the named”(abhinatvaṁ nāma-nāmīnaḥ). This is certainly the Gauḍīya conclusion, but it does not mean that the name is just a sound with no meaning. It means that the the sound of the word is intrinsic to and inseparable from its meaning. If the true Gauḍīya attitude is that name of Krishna has no meaning or is “beyond meaning,” why would the founding ācārya of the Gauḍīya school, Śrī Jīva Goswāmī, explain the meaning of the name in Tattva-sandarbha? There is a difference between a sound and a word: a word is a sound that has meaning (viz. Śabda kalpadruma: sa ca dhvanyātmako varṇātmakaś ca). Nouns are words whose meaning indicates a specific entity (viz. Bhāgavata Sandarbha: mano-grāhya vastuno vyavahārārthaṁ kenāpi saṅketitaḥ śabdo nāmeti). An example of the first type, if you call a person “Joe” long enough the word “Joe” comes to identify the person. This is a temporary, created association. An example of the second type is to name a town “Little Falls” because it is by a river with a small waterfall. Or to name a girl Summer because she was born in the summer and has a very warm personality. This is a natural association between the name and the named. There are two types of nouns intrinsically connected to the entity they identify. The first consists of nouns like Little Falls and Summer – nouns relating to temporary entities. The second consists of nouns like “Krishna” “Hare” and “Rāma” – nouns relating to eternal entities. In the second case, the connection between the noun and the entity it names is eternal, and thus the name and the named are inseparable. It is not an aparādhā to say that the name of Krishna is a word. It is an aprādhā to say it is an ordinary word, a sound temporarily associated with some meaning. If the name of Krishna was not a word it would not be called a “name.” The name is not an ordinary word, but it is simply an attempt to appear esoteric to say “the name is not a word,” or “the name is beyond meaning,” when everyone knows that a name is a noun, a noun is a word, and words are sounds that have meaning. Great devotees like Śrī Gaurakishor and Śrī Caitanya Mahāprabhu said the name is made of letters. Letters form words. Everyone knows this. Everyone knows the name is a word, but what only the Vaiṣṇava’s know is that the name of Krishna is an “ajanika” word, an eternal noun for an eternal entity, and therefore “Krishna” and Krishna are indivisible (abhinatva). How to Pronounce an Eternal Word? Since the name and named are inseparable it stands to perfect reason that we cannot truly access one without the other. We cannot comprehend Krishna without comprehending “Krishna” (the word). And we cannot comprehend “Krishna” without comprehending Krishna. Thus ordinary people have absolutely no access to eternal words, which is why we doubt they even exist. It requires some comprehension of eternality before one can hope to pronounce and hear eternal words in their true form. Thus we must start our endeavor to clearly understand Krishna. How do we do that? By contemplating śāstra under the guidance of someone who clearly understands śāstra (guru). For Gauḍīya’s the supreme śāstra is Śrīmad Bhāgavatam. So, by contemplating Śrīmad Bhāgavatam under realized guidance, we come to understand something initial about Krishna. 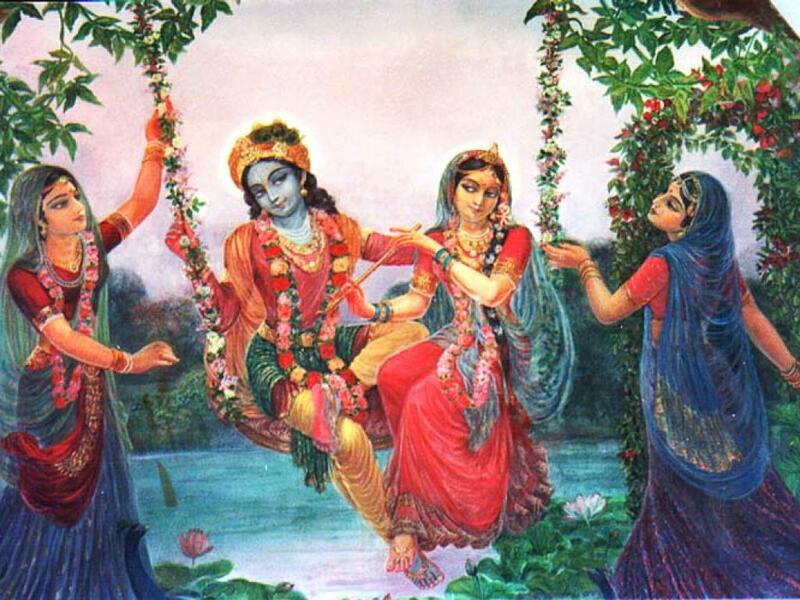 Once we understand something about Krishna, we don’t have to make any extraneous effort to try to think of Radha Krishna while chanting “Hare Krishna.” The entity being named naturally appears along with the sound of the name when it is an ajanika noun and we comprehend something about the entity. In a sense, this works even with an ordinary noun. When you hear even an ordinary noun, like “Santa Claus,” do you not spontaneously think of christmas, a jolly fat man in a red suit, or whatever else you know or have associated with Santa in your memory? Similarly, if we know a little about Krishna by contemplating Bhāgavatam, then, by hearing “Krishna” we will naturally become aware of a flute-player with a peacock feather in his hair, who is the root consciousness at the origin of all existence (or whatever it is that we may have learned about Krishna from Śrīmad Bhāgavatam). In this, please note carefully that we are not paying attention to anything besides the name. It is by paying attention to the name that the named (who is inseparable from the name) manifests in the consciousness simultaneously with the sound of the name. This still is not a direct transcendental realization of “Krishna.” It is not entirely mundane either. It is a mental association created by the guidance we’ve recieved from transcendent sources: Śrīmad Bhāgavatam via Śrī Guru. These glimpses of the meaning of Krishna make it far, far easier to concentrate attentively on “Krishna” without any strange misunderstandings of what “Krishna” indicates. Attentive, non-misconstrued chanting of “Krishna” is often described as “inoffensive.” It is beyond nāma-aparādhā, significantly closer to the REAL name, śuddha-nāma, not just the sonic counterpart of it, nāmākṣara. Since it is closer to the real name, the real entity named can be more directly perceived in our contemplation of “Krishna.” This allows us to more deeply REALIZE the things we have heard from Bhāgavatam’s ślokas. So, hearing Bhāgavatam and chanting Krishna-nāma are symbiotic practices that go hand in hand. One doesn’t fully “work” without the other. Sri Rupa says here that the true name of Śrī Krishna is not something that senses like a tongue can create. The tongue can pronounce the sound “Krishna” but cannot produce the eternal form of the word which is inseparable from Krishna. It is only when one has the proper attitude towards the name that the true name wants to manifest in our chanting, singing, or speaking. Next Did Prabhupāda know things that the Six Goswami’s Did Not? Can we jivatmas become parmatmas? Can we become visnu tattvas? na tvevāhaṁ jātu nāśam, na tvaṁ, neme janādhipā, na caiva na bhaviṣyamaḥ, sarve vayaṁ ataḥ param. So, the answer is no. Jivātmā is eternal. It does not change its constitutional nature and become some other tattva/substance. But paramātma-viṣṇu is the ROOT of the jīvātmā. If we connect (yoga) to the root we are linked with paramātmā-viṣṇu and operate in perfect concert.